Peach hair color is making a comeback. Following the announcement of Pantone’s 2019 Color of the Year, Hyper Coral, the demand for pinky-orange tones is higher than ever. Ready to answer the call? Then recommend this warm take on rose gold hair to any clients who crave a punchy pastel that fades like a dream. Peach’s complexion-enhancing, shine-boosting abilities will tick off all their spring/summer hair goals. So, how do you get the look? Darker hair will need pre-lightening in order for the shade to make an impact, while existing highlights should be given a yellow undertone to support the peachy hue. Once hair is light enough for the peach tones to show up, ask your client what intensity they’re looking for, and how committed they want the shade to be. You can create an array of peach hues, from an acid peach wash to a pastel tint, with Wella Professionals’ portfolio of color services. For subtle, low-commitment peach hair, try a temporary hue using Perfecton by Color Fresh. 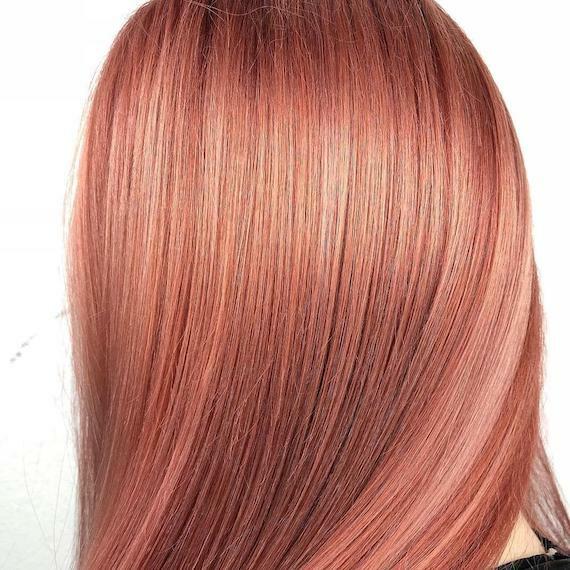 This specialty leave-in color lasts for up to three washes, and can be custom-blended to a warm, peach tone using a mix of copper /43 and gold /03 with a touch of red /44 or mahogany /5. 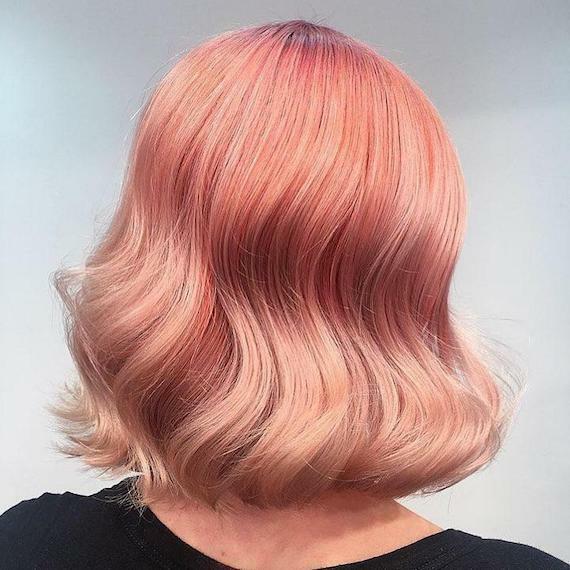 If your client is ready for a bolder, longer-lasting look, try Color Fresh CREATE; a semi-permanent color that comes in the shade Hyper Coral, which pastelizes to a peach hue when mixed with Tomorrow Clear. Color Fresh CREATE holds all the shades you need to create this vibrant peachy mane. Created on a level 10 at the Cambridge Hair Collective, it features 20g Hyper Coral + 10g Nu-Dist Pink, combined with a pastelizing 60g dose of Tomorrow Clear. The blend was then left to process for 20 minutes, resulting in the most festival-ready acid wash.
Like blonde nontouring, this look relies on careful placement of color that glows. 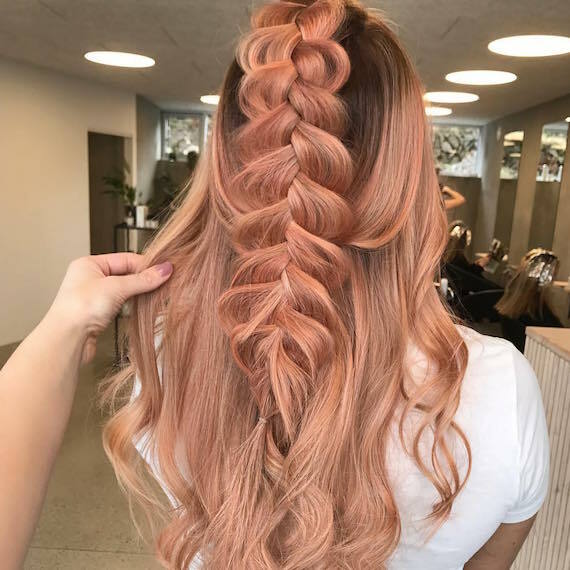 It’s as pretty as peach hair can be, while still packing plenty of wow factor. Ásla Breyt Danielsen gave the look a twist – literally – with this flawless half-up ‘do, which allows the pastel tones to really stand out against dark roots. Glass hair meets peach hair in this sleek, straight look. Created by color expert, Linn-Alexandria, it’s brimming with the kind of shine we usually get from a misting of EIMI Oil Spritz. To recreate the gloss on a newly-peached ‘do, spray the oil into the palm of your hand, then press over the surface of straightened locks to eliminate flyaways. With a touch of metallic, this copper peach hue is a sunset-inspired take on the trend. If you have dark blonde hair, leave a little bit of root on show for a cool graduation of color. Complete the look with loose, glossy waves using the volume-enhancing Pro-Curl tong. This cool creation by Jenni Vehkaoja is as peachy as it gets. To get the look, she started with a balayage technique using Blondor Freelights, 20 vol developer and a little Blondor Magma /44 + /36. 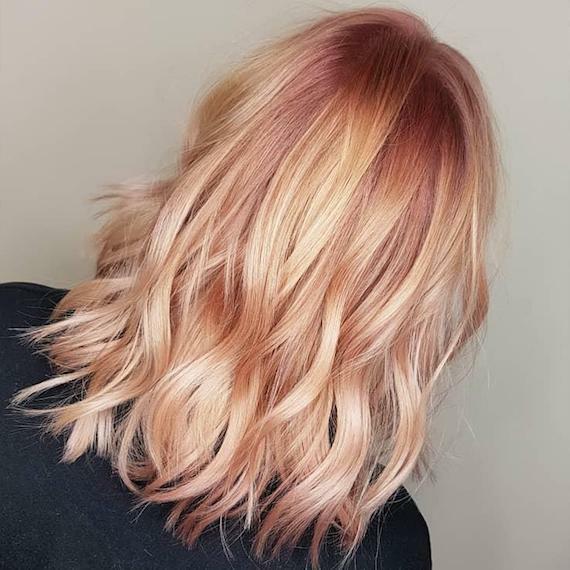 Jenni then washed the hair and applied Color Touch Instamatic in Pink Dream with a pastel developer, before misting strands in EIMI Sugar Lift for an injection of texture. 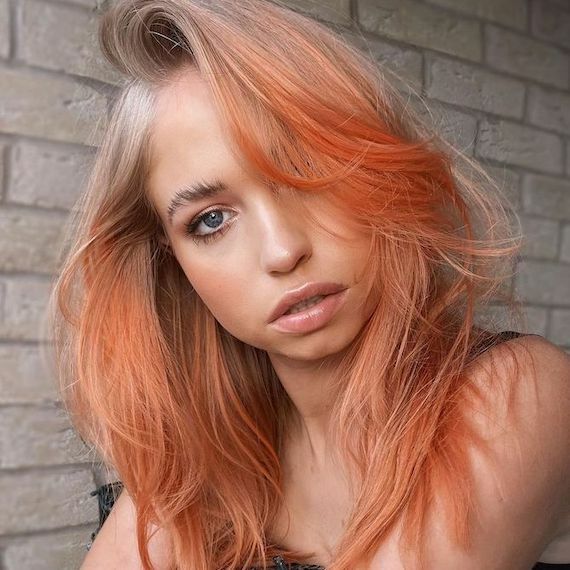 For clients who want a little more orange in their peachy look (think a pale apricot tone) add Color Fresh CREATE in Infinite Orange to a blend of Hyper Coral and Tomorrow Clear. 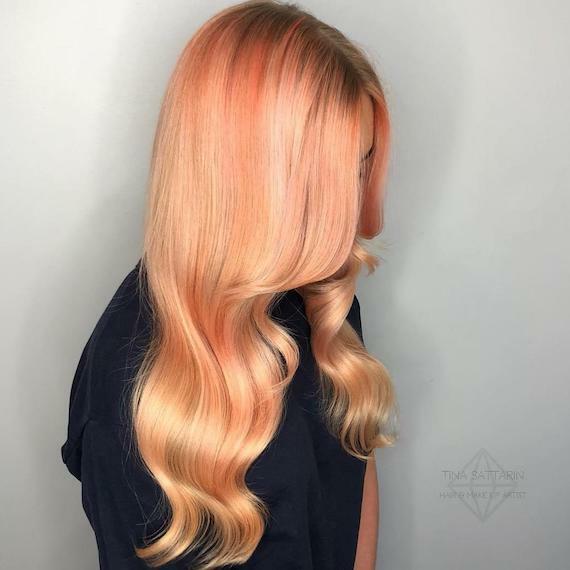 We love how Tina Sattarin has alternated soft, peach highlights with more vibrant orange tones, resulting in a mesmerizing, multi-tonal finish that looks mermaid-inspired. Add curves to a pinky-peach hair look by prepping towel-dried locks with EIMI Boost Bounce hair mousse. Use fingers to smooth from root to tip for volume, condition and major shine. Blowdry using a round brush to style then, while strands are still slightly damp, use the Curl Styler heated brush (with the largest brush attachment) to shape mid-lengths into a loose, glossy wave. That glow, though. 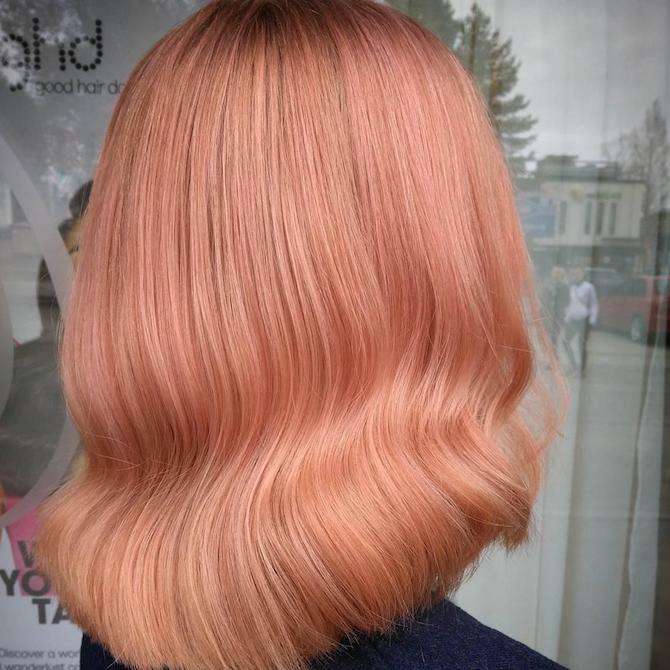 The shine in this peach hair look shows just how flattering a warm pastel hue can be. While the client’s natural blonde color looked healthy, a veil of juicy peach hues added an ethereal, reflective finish that shimmers with every curve and swish of the hair. Dreamy. Keep hair looking peachy by swapping traditional shampoos for care products that cater to colored hair. We love INVIGO Color Brilliance Color Protection Shampoo and Color Recharge Red Conditioner. The conditioner deposits a small amount of pigment every time you use it, instantly refreshing the warm peach tone in between color appointments. Make sure you also safeguard strands during heat styling with EIMI Thermal Image; a heat protectant spray that helps to counteract the color-fading effects of your favourite hot tools. 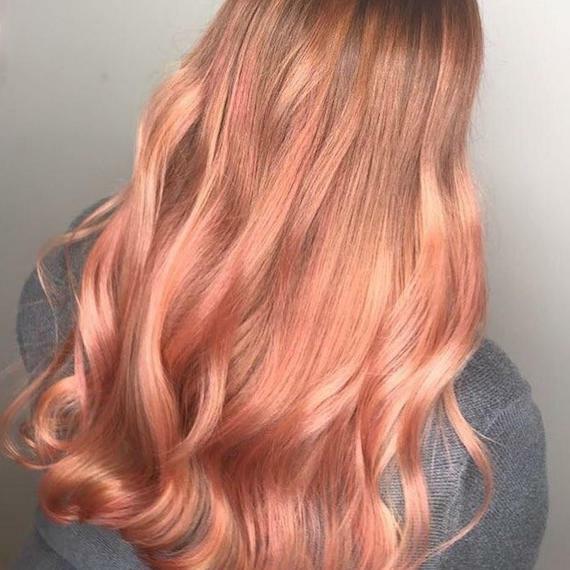 Looking for more peach hair inspiration? 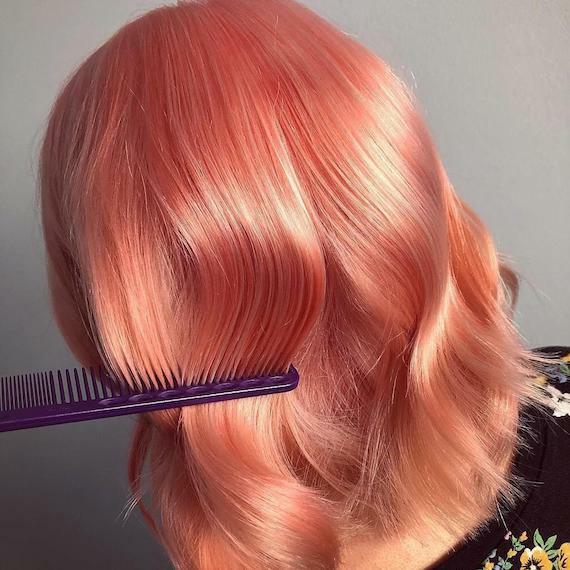 Discover the Candy Peach look, created by Wella Professionals #ColorCreator, Abby Smith, using Color Fresh CREATE. You’ll also find endless hair ideas on the Wella Hair Pinterest board, and @WellaHair Instagram. Make sure to tag us in your photos with #WellaHair #AskForWella to show off your latest styles and be in with the chance to get featured on our social channels. Some products are only available to professionals.